Escape the urban bustle at Playa de las Teresitas and Playa Bollullo. Kids will appreciate attractions like Loro Parque and Playa Jardin. Venture out of the city with trips to Bubble Soccer Tenerife (in Santa Cruz de Tenerife) and ARTlandya (in Icod de los Vinos). There's still lots to do: admire the verdant scenery at Orotava Valley, take in nature's colorful creations at Botanical Gardens, and pause for some serene contemplation at Iglesia de la Concepcion. To find traveler tips, maps, more things to do, and tourist information, read our Puerto de la Cruz travel itinerary planner. London, UK to Puerto de la Cruz is an approximately 7.5-hour flight. You can also do a combination of bus and ferry. Traveling from London to Puerto de la Cruz, you'll lose 1 hour due to the time zone difference. Wrap up your sightseeing on the 24th (Fri) early enough to drive to Arona. Relax by the water at El Medano and Playa de las Vistas. 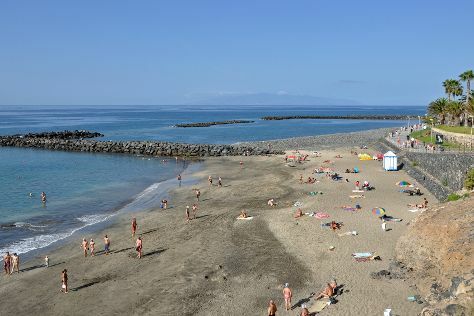 Take a break from the city and head to Teide National Park and Playa Del Duque. Plan for a day of cool, family-friendly fun on the 24th (Fri) at Siam Park. To see other places to visit, more things to do, ratings, and other tourist information, use the Arona online itinerary creator. Traveling by car from Puerto de la Cruz to Arona takes 1.5 hours. Alternatively, you can drive; or take a bus. You'll gain 1 hour traveling from Puerto de la Cruz to Arona due to the time zone difference. In March, daily temperatures in Arona can reach 26°C, while at night they dip to 17°C. Cap off your sightseeing on the 30th (Thu) early enough to travel back home.